07 10 The work of demolishing the brick work of Herman Grube’s store front at 304 Main Street has been commenced. Mr. Grube will place a fine plate glass front in the building on the ground floor and also the upper story which will add much to the attractiveness of that popular shopping place. Flowered carriage in the Harvest Carnival, held Sept., 1899. Mayor Herman Grube and daughter Zayda, Jennie Kusel and Jennie Evans. Tuesday evening a large number of friends and business associates were entertained by Ex-Mayor Herman Grube at his hospitable home in 5th Street in honor of his 25th year in business in Watertown. His amiable wife and courteous family ably seconded him in extending a happy greeting to their guests and in making all feel that a wide-opened hospitality was extended all present. Hearty congratulations were extended by all present and Ex-Mayors William F. Voss and H. Wertheimer made appropriate speeches to which Mr. Grube feelingly responded. 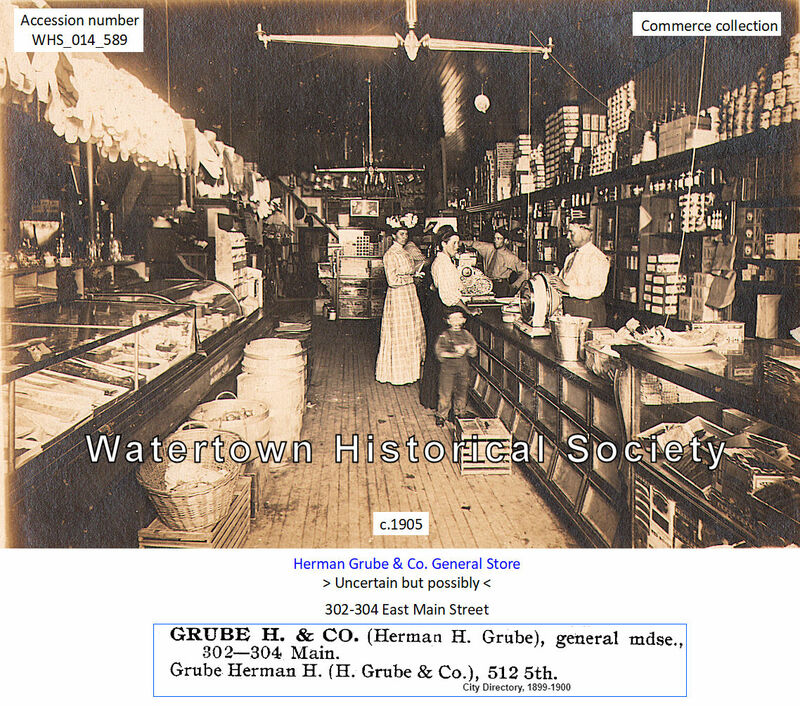 January 11, 1885, Mr. Grube opened business at his present stand [302-304 E. Main] and his general merchandise store from that day to the present has been one of the most popular in the state. He has enjoyed a most excellent trade from the start, and his fair, honest dealing has made hosts of friends for him all over Dodge and Jefferson counties. He is a native of the town of Emmet, where he was born March 3, 1854, and has ever since resided in this vicinity. October 12, 1879, he was married to Aurelia Schatz and to them were born one son and two daughters. Mr. Grube has represented his ward two terms in the city council, he has been mayor two terms and represented this district in the state legislature. He is a member of the Watertown Advancement Association and at present he is favorably mentioned in connection with the office of mayor for the coming two years. Watertown’s interests have always been uppermost in his mind and our people hope he will live long and prosper among them. Herman G. Grube Democratic Club Formed. Not since the late Grover Cleveland was president of the United States has so large and enthusiastic a gathering of democrats been held in this city, as that which was assembled at the city hall last week Thursday evening to talk over city politics and arrange for an old time united democratic campaign in this city. Many thought it was too early to begin a city campaign, and others believed it was high time to get busy, hence on Tuesday a call was issued by the city chairman for a mass meeting for Thursday evening and though the time was short and there were many social, fraternal and theatrical performances on that evening, over 125 representative democrats were on hand, and a more enthusiastic number never came together in this city. The meeting was called to order at 8:15 o'clock by James W. Moore, chairman of the democratic city committee, who was elected to preside at the meeting, and Assemblyman C. F. Viebahn was appointed secretary. The chair said it was a good omen to see so many democrats present, and that it scented victory in the air for the democrats not only at the spring but at the fall elections. After stating that the principal object of the meeting was to consider the matter of a candidate for mayor, John Schatz, that prince of loyal democrats of the 1st ward, a man who never changes his spots in politics, placed in nomination Ex-Mayor Herman G. Grube for the consideration of the democrats of this city for mayor at the coming spring election. The chair stated that the present mayor, Arthur Mulberger, had positively declined to be a candidate for future honors in that line, and called on him to make a few remarks. The mayor said he believed in a change in office and said that if opportunity offered in the future he would gladly respond to calls in civic matters, but at present he was not so situated that he could devote further time to the office of mayor. He heartily seconded the nomination of Mr. Grube, whom he highly complimented as a citizen and democrat, and spoke eulogistically of Mr. Grube's former good record as chief magistrate of our city. Democrats, he said, should get together and by organization and harmony win political battles of great moment in the near future. They would stick right with Mr. Grube as a standard bearer in the present municipal campaign. John G. Conway was next to heartily second Mr. Grube's nomination, and he followed with a neat little speech on the tariff question, and stated that with harmony and organization he believed the democrats could elect a congressman in this district this fall and two years hence a president of the United States. District Attorney R. W. Lueck, Ex-Mayor John J. Brusenbach, Alderman Chas. Lutovsky, Emil Tanck, Frank S. Weber, John T. Ryan, H. R. Moldenhauer, Dr. C. R. Feld, Frank Kalina, and Ferd. A. Krueger also delivered well-put neat little speeches. At the close of the speech-making, Mr. Grube was nominated by a rising vote and three rousing cheers and a "tiger" were given him. Calls for Mr. Grube came from all sections of the hall and after thanking his fellow democrats present for the fine spirit of confidence shown toward him, he said that when he left the mayor's office a few years ago that he never expected to become a candidate again for any office, but that within a few days past after being solicited by many of our citizens to become the democratic candidate for mayor, he took the matter under consideration, and after witnessing the hearty endorsement at the meeting, he could not well refuse the honor so graciously tendered. Executive committee—John Schatz, John J. Brusenbach, D. Schwieger, Eugene H. Killian, Herman Zickert, Frank Petro, John G. Conway, Charles Mulberger, Ferd. Schmutzler, John T. Ryan, W. C. Radtke, R. M. Halm, C. A. Kading, William Schimmel, Paul A. Schoechert, W. F. Voss, Herman E. Krueger, August Kuehn, O. A. Vaughan, Theodore Nell, Frank Auer. Finance committee—Ferd. A. Krueger, G. M. Gahlmann, R. H. Schott, Frank S. Weber. The democrats of Watertown are rallying almost solidly to the support of Herman G. Grube for mayor, and many republicans are also sounding his praises, for all realize that he is one of Watertown's best-qualified citizens for that office. He is conservative, yet progressive and energetic in all things pertaining to the prosperity and welfare of our city, not only in a business way, but morally as well. He is fair and considerate of all conflicting interests and is known as a man who gives all a "square deal" without fear or favor. He is one of Watertown's most successful and enterprising businessmen, and has been identified with everything here that tends to advance Watertown's interest, being a member of the Watertown Advancement Association, an officer of the Inter-County Fair Association and an officer of the Watertown Homecoming Club. He has served Watertown faithfully, honorably and creditably in the past as mayor, alderman and as a member of the state legislature, and as he says himself he intended keeping out of politics in the future, but a short time since his old democratic patriotism was stirred when he heard some of his republican friends were saying "there are no longer any democrats in Watertown—they can't even find one to become a candidate for mayor." This had been so persistently repeated not only in Watertown but in neighboring cities, that he resolved he would do what he could to get a candidate, if he had to enter the arena himself. Mr. Grube tried to persuade others to become a candidate, but all said he was the man who could lead the democratic hosts to victory. Come, brother democrats, let's buckle on our armor and give Mr. Grube an old-time democratic majority for mayor. From now on we hope to see every democrat in private life, every democratic office-holder in the city, and every democratic newspaper sounding his praises. The newly-elected mayor and city council met for the first time last Tuesday evening in the council chamber at the city hall. Mayor H. G. Grube called the meeting to order and Ex-Mayor Arthur Mulberger presented the new mayor to the city council. Ex Mayor Mulberger and Wm. F. Voss occupied seats beside Mayor Grube. The council chamber was beautifully decorated with potted plants, palms and the national colors. The council was organized by electing John Kehr president. The mayor's message, which will appear in our next issue, was well received by the council and all citizens present. In it he makes some fine recommendations for the government of the city during the next year. On Tuesday night last Mayor Arthur Mulberger surrendered the head of the city government to his successor Herman G. Grube. In retiring from office, Mr. Mulberger carries with him the good wishes of all our people, no matter where he may be located or in what business he may be engaged. We hear it said he may decide to locate in Chicago. He has served our city faithfully and well four years in the office of mayor, and though a young man, he has handled the many perplexing questions that came before him wisely and well—true probably not to the wishes of all citizens, for that is an impossibility. Always conservative, yet progressive, he guided the government of our city in a manner that would do credit to older and more experienced heads, and that too in the face of many obstacles. His successor has served our city faithfully and well in the office before, and all feel that he will guide the ship of state safely on to the end of his administration. He is a safe, conservative, progressive man, and we believe the citizens of Watertown made an excellent selection when they elected him their chief executive. The Gazette will do all in its power to help make his administration a successful one. 04 29 In compliance with a precedent long since established by city’s chief executives, I shall briefly outline and submit my communication to you embodying in it such recommendations and suggestions as to me seem proper at this time. An administration that is managed loosely cannot be financially successful; it should be our aim to conduct the affairs of the city in the future so as to continue the confidence of the outside world in the capability of Watertown to furnish adequate security to all investors who may desire to come here and invest their money. The treasurer's report shows that Watertown is today in a position which reflects credit upon its citizens and which should assure continued confidence. Harmony and good feeling should at all times prevail; this will accomplish the best results. The confidence placed in us should not be misused and all measures affecting the interests of the public should be carefully considered and disposed of in a manner so as to best promote the welfare of all our citizens. Our aim should be to transact all public matters in a business-like way, not for the benefit of any clique, faction or individual interest, but for the welfare of the whole city. It should be our aim to reduce expenses, wherever possible, and I believe economies can be introduced that will save the taxpayers much money and which will not interfere with the business of the city's government. Statement showing balance on hand in the following accounts April 11, 1910, as reported by the city clerk . . . The reason the waterworks fund is overdrawn is because the dues from December 1, 1909, to March 1, 1910, have as yet not been collected. When this is paid the waterworks fund will show a balance of about $2225.00 instead of an overdraft of $355.41 . . .
After West Main from Montgomery Street to the North Western railroad tracks is paved, I would suggest that we should first reduce the amount of indebtedness before more bonds are issued for street improvements so as not to make taxation excessive and burdensome. Improving the roads leading out to the city limits should be paid out of the street improvement fund without issuing more bonds and making taxation more burdensome. The work of our fire department has been up to its usual splendid standard and its record thus far is one in which our citizens can well take pride. The apparatus of the department is in good repair, and the condition, as a whole, is quite satisfactory. For the year beginning April 1, 1909, and ending March 31, 1910, there were born in this city 145 children. The number of deaths during the same period were 98. Most of these were young children and old people. The sanitary condition of our city is most gratifying. Of contagious diseases we have had one case of typhoid fever, 4 cases of diphtheria and only two of scarlet fever, all of which ran a mild course. The orders of the health commissioner were faithfully obeyed in all instances and very few complaints of nuisances were received by the health department. This makes a record which we may well be proud of. The city waterworks plant is in good condition and covers about eighteen miles of mains. The complaint that water is being used without the city receiving payment therefore is certainly groundless now. Whatever may have been the facts in former years when the great majority of water takers were on a "flat rate," the city is now on a meter basis entirely and every water taker pays for what he uses, and the wasting of water is thereby stopped; and any party who wastes water must pay for it himself. I find that since the city owns the waterworks, the rates have been reduced thirty per cent from those charged by the private company. The following rates are charged . . . I recommend that complete accurate maps and records be installed and kept in connection with the operation of the system as to the location of all water connections, mains, etc. In conclusion allow me to again urge and ask for harmony, good feeling and respectful treatment of every question, and an effort to perform official duties with due deliberation. Full and proper consideration should be given to all important questions, and no hasty legislations should be transacted. By so doing we may be sure that our deliberations will produce results beneficial to all our citizens. The death of Ex-Mayor Herman G. Grube occurred at 10:30 o’clock Thursday night in the family home, 512 [S] Fifth Street, following an illness of several months duration, during which time all that medical skill could do was attempted in an effort to prolong his life but proved of no avail. Owing to his critical conditions his death was not unexpected but it will be learned with deep regret by his many friends in this section. Mr. Grube had been an esteemed resident of this city and section during most of his life. He was born in the town of Emmet March 3, 1854. On October 12, 1879 he was united in wedlock with Aurelia Schatz who survives as do also one son and two daughters. Coming to Watertown when a young man he launched into a business career and became one of the best known business men in the city. After serving as an apprentice in local stores he engaged in business for himself on January 11, 1885 and in the year 1910 celebrated the twenty-fifth anniversary of his business career and later retired from the retail business to devote more time to the management of the Wholesale Grocery Co. of which he was manager several years. Mr. Grube was a man of pronounced views and when he believed himself in the right could not be shaken from his position. He was honored by the people of Watertown and held several positions of trust in all of which he served efficiently and to his credit. He was elected by the democrats as alderman of the First ward and served two terms, 1893 and 1894. He was elected mayor of the city in 1899 and 1890 and again in 1910 and 1912. He also served one term as assemblyman from this district. He has been a member of the Watertown Advancement association for many years and his judgment was recognized in the deliberations of that body which has done much for the industrial development of the city. When the project of a county fair for Watertown was broached Mr. Grube was one of its ardent supporters and helped in many ways to launch it to a successful issue. He had been previously identified with the Watertown Driving Association, which was merged with the fair association, and was elected treasurer of the Watertown Inter-County fair, which position he held during the first three years, relinquishing the office owing to stress of other duties connected with the fair. He also served for a time as cashier and director of the Wisconsin National Bank. Mr. Grube was a man of fine character whose word could always be relied upon, and during his life in Watertown was always willing to aid those in distress and do a kind act when the necessity became apparent. He had many warm friendships which he retained until the grim reaper cut him down. He was always proud of Watertown and played well his part in promoting its material development. As in public life he had the respect of all, so in private life he won the warm regard of all who came in contact with him and leaves a host of friends to deplore their personal loss and that civic loss involved in the death of a good citizen. The surviving children are Percy B. Grube, Miss Zayda Grube, this city and Mrs. E. G. Meilahn, Milwaukee. One brother, Erdman Grube of Emmet and one sister, Mrs. Herman Oestreich of this city, also survive.